How do you know? You weren't part of the STURP team that examined it in 1978 or the experts that did carbon dating in 19. Mere statements are not "Proof" What studies and tests do you know have been done on it? I could make a flat assertion like "No it isn't". But instead I'll ask if you know and understand what is involved in Radiocarbon Dating? Do you plan on copying everything you posted before at christianforums.com, or just the long ones? I was one of the best Christian Defenders they had, no one unless they trolled would beat me in a debate, hopefully I helped and converted folks to The Truth of The Bible. Sometimes we do not see ourselves and others as we really are. How old are you? 19? Do you really believe God ended suffering with the Bible? which in turn ends Physical Suffering. I'll let you argue with those closer to your age group. Why the insult? I'm defending The Bible and I did it well, you should be with me, what I do to you? I destroyed The problem of suffering(Thanks to The Lord Jesus Christ), this should be good news to you. who cares how old I am? see now I'm dead on this website, on ChristianForums I would destroy all man made anti-Biblical doctrines well, and others would agree until I gave my age, then they used that against me, if I kept my age secret there would be no rebuttals as my arguments are rock solid, The Holy Spirit Inspired me. My friend, you have not been ordained by St. Paul like St. Timothy, nor have you been called by God like the Holy Prophet Jeremiah. You may think so, but it does not appear that way. You have a lot to learn. The first lesson is to become a disciple, silence and humility are first required. That is way more impressive and produces finer results than unsolicited arguments. Folks, we're dealing with a textbook narcissist here. Appealing to reason or civility won't work, even if he were 50, not 18. He's too enthralled by his own awesomeness. Come on LBK, give him a chance. Only an act of God can sway such types. I'm old enough and ugly enough to know, and I've tangled with quite a few of them in my time. The older ones are just as stubborn as the young 'uns. How did I say I'm better than anyone? I attributed my success to The Holy Spirit and the arguments I use are a culmination of geniuses touched by The Holy Spirit. I say you will not win, not to be proud but because it's Fact, ANYONE who uses these arguments, such as William Lane Craig will not lose. Are you sure you've even begun to study Orthodox Christianity? Is the work of the Holy Spirit to win debates or to win souls? To win debates that win souls. Look at Stephen, Truth has to be told. A vessel must first be filled in order to pour anything out of it. You could win every debate and yet have not one person come to Christ. I agree, that is therefore a personal rebellion problem in which debates cannot help, what I do as other Theologians do is debate The Fact of God's existence, that it becomes irrefutable, they will have no excuse, there then if they make excuses prove personal reasons. That is not what the real theologians did. No offense, but you seem like somewhat of a narcissist. I get where you are coming from--there was a period when I got all obsessed in the pseudo-philosophy and silly debates and articles of Christian apologetics. Then I found Orthodoxy and realized that simple knowledge of theology already solves like 90% of the atheist worlds' objections because most of their objections and problems with Christianity come from a distorted view of Evangelical-Protestant doctrine. Moving on, nearly like 90% of all modern apologetic arguments for God are based off of ignorance, or, at the very best, are only cases for a deistic god at best, but do nothing to prove that the God of Christianity is true. Hurray, you may have refuted atheism, but now you have to explain why your God is the real God and thus effectively refute millions of other religions which have belief in a God/gods. Your famous "First Cause" thing argument could just as effectively be used for Allah, Oden, Shiva or Zeus. Does nothing to prove the God of Christianity that we profess belief in. First Uncaused Cause Fact proves Genesis Correct, since that is correct God can only be The Trinity of The Father, The Son, and The Holy Spirit, 3 Persons, 1 God. also God has to be multiple Persons, otherwise He would be incapable of loving others. Yeah, we actually have many of those relics, and in 13 days, when the Patriarch of Jerusalem goes to bless the waters of the Jordan River on the commemoration of the Lord's Baptism, the river will reverse its flow--a completely unexplained miracle--as it has every year since 33 AD. So what? So, the elder told them, "Hand me that axe over there." "What do you want that for, elder?" "I'm going to chop your heads off and miraculously put them back on," he said, "only don't move. I don't want to get you mixed up." "We don't want you to do that miracle, Father," they said. And the elder replied, "God doesn't want us to believe in Him because He is all powerful or works miracles [or even has irrefutable arguments], but because He is so kind." The lovingkindness of God is rarely if ever shown in debates, or even words. It is shown in deeds. And the objective of these is never to exalt ourselves or, I dare say, even to explicitly glorify God or save anyone. They are just for the sake of love. More people become Christians through acts of love than through any other method--four out of five doctors of the Church agree about this. I fear for you because you have zeal, but little if any experience in spiritual life. You can do more harm than good through the injudicious application of your or others' ideas. The sad irony is that, as much as you claim to be a great debater, you will not be swayed by anything anyone here has to say. Fortunately for you, there are on this forum people of real Christian kindness who, though they may never post, will remember you in their prayers. I commend you to God, who alone knows the heart and how to help. No. 3 would be something really impressive. If SavedbyChrist has refuted the problem of suffering, why did reading the opening post hurt so much? Oyyyy!!!! Is there such a thing as a triple facepalm?? Apoplexy, here we come! only while smashing the titanic ego, one must care not to harm the spirit. 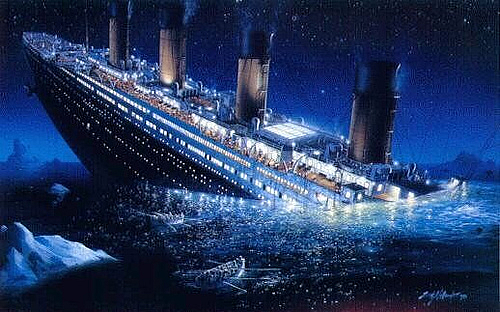 And we all know what happened to the Titanic, don't we? I don't get it, you guys got me feeling down and out like I should give up on Apologetics and just focus on my Spiritual life because I am not good at it. for example, what did I do wrong? I refuted the problem of suffering, not to get benefit from it, anyone can use this argument and take the credit, I wrote it because alot of people deal with the problem of suffering and it could hinder their faith, so I refuted it, making it a nonexistent ostabcle, I say by The Holy Spirit that I did it is because, by The Holy Spirit I did it, He gives us truth and gave me The Truth to logically refute the problem of suffering. Winning debates, this should be a strive for, if you don't strive to do it you won't win, if you don't Pray you'll never grow(Spiritually), Christianity needs to do what Jesus Christ said, Preach His Word, and that is getting very difficult to do when you have "atheistic" lies being spread, an obstacle to the faith just like sin is, should we give up trying to win debates and proving Christianity is Scientifically, Historically, Philosophically, Logically, Factually, and Personally True and let "atheism" reign? No, same question would be should we stop trying to fight evil(sin) and let sin reign? No. We ought(me included) to give money to the poor every chance we get, invite them in our homes, try to end sin, but we fail to do so. We ought to Preach against "atheism", Preach in every streetcorner, the best we can, but we fail to do so. But if you don't address what real people, even those who are atheists, really say and believe, instead of what you say that they think then why should they pay attention to what you say? Telling someone that they do understand what you mean when they say that they don't isn't paying attention to the real human being. And, I'm sorry, SBC94, but just making flat statements is not any sort of proof or "refutation". The ideas may connect in your mind but that doesn't make them convincing to others nor follow logically. As to the problem of suffering, again, I'm sorry but you did not "refute" it. It still exists and your insistence that you've solved a universal problem doesn't make it so. Have you ever read The Problem of Pain by C.S. Lewis? or another of his works A Grief Observed? Finally, if you are trying to prove that Christianity is true Historically, then use real History with real support. If scientifically, then use real science with true and reliable sources, if logically in debate the use the guidelines and rules of logic and debating. Just saying "I'm right" doesn't make it true. for example, what did I do wrong? Okay, I'm going to be blunt. Your debating style is on a par with a five-year-old's. Saying it is so doesn't automagically make it so. Arguments need support, and your arguments have precious little of that. As Ebor said, you need to provide factual, logical, scientific proof to back yourself up. 'You didn't understand' doesn't cut it. They understand, all right, they just don't agree. St. Paul started preaching to the Jews that Jesus is the Messiah immediately after his conversion, yet it took some time away, a few years in the desert, in fact, for him to learn how to preach effectively. Judging from your recent futility at what you call "preaching", I think you're likely going to need the same time away for training that St. Paul needed. It could be a few years, so be patient. Hmm. I remember that Christ said to go forth and baptize all nations, but not that he said to go forth and argue with all nations. I would hope that in the light of the truth that is Christ, we would not really be in the arguing business. Truth is its own argument-ender; against Christ the Lord no one will stand. I don't know of anyone who was ever successfully argued into the faith (at least not on a long-term basis), but there are plenty who were argued out of it. Food for thought, maybe. You seem to assume that all are called to be apologists, to defend Christianity logically instead of or in addition to witnessing with and through love. That is not a good assumption. You are eighteen years old. When I was eighteen, I wanted to defend Christianity from noxious, silly, atheistic rhetoric as well. Because it is true, and good, and Christ is truth, and goodness. But that was not my only motivation, maybe not even my primary motivation. I persisted in my apologetics, I became shrill and uncompromising and failed to hear what my opponents were saying, or discern why they were really saying it, because I was prideful, inexperienced, insecure. I was growing into my faith and wanted a solid, logical foundation on which to rest. That would not have been important to me if these atheist arguments had left me unshaken and confident. And it does excite ones pride to make such 'theological breakthroughs.' Before you protest that you are pure and unsullied by these concerns, take a moment to reflect on how you feel when you perceive yourself to have triumphed over your opponents - especially when they go away unchanged. I don't mean to talk down to you. I am your elder but I am not your superior. But I have done what you are doing and I really don't believe it is spiritually healthy for young persons and new Christians, who have not tempered their zeal with experience and wisdom. A spiritually mature person does not need a logical answer to every logical difficulty. If they find one, well and good. But it is better to pray than to allow your mind to dwell on these things. An atheist can produce a new/old/tweaked criticism of Christianity every hour and nothing would please the evil one more than for you to spend every hour of your day dealing with their vitriol. Even if your intentions are pure as driven snow, how can making debates the focus of your Christian life possibly be healthy? You cannot immerse yourself in filth and expect to go away smelling like roses. Do you attend a church? Do you have a spiritual guide - a priest, a pastor, an elder? I think you need to spend more time trying to live a Christian life. These intellectual concerns can be become distractions or worse, if we allow them to define our Christianity. If we spend most of our time thinking of our religion as an abstract, logical thing, there is a danger that it will become nothing more than that. Perhaps if, in a few years, you still feel you are called by God to be a professional evangelist or an apologist or the like, you can think of picking it up again. Yea, there is strength in striking root, and good in growing old. If I may offer my perspective. I was like you once. I also saw in Christianity an endeavor to refute atheism (and anything associated with it) and other religions. I find it intellectually stimulating, but spiritually debilitating, as I concentrated less and less on my spiritual life and neglecting also the alms and services for others, which matter most. 34 Come, you who are blessed by my Father; take your inheritance, the kingdom prepared for you since the creation of the world. 35 For I was hungry and you gave me something to eat, I was thirsty and you gave me something to drink, I was a stranger and you invited me in, 36 I needed clothes and you clothed me, I was sick and you looked after me, I was in prison and you came to visit me. 44 Depart from me, you who are cursed, into the eternal fire prepared for the devil and his angels. 42 For I was hungry and you gave me nothing to eat, I was thirsty and you gave me nothing to drink, 43 I was a stranger and you did not invite me in, I needed clothes and you did not clothe me, I was sick and in prison and you did not look after me. Do really seek to be a "theologian" in the strictest sense, to seek to "know God" as theology really is? Then know God through praying to Him, by increasing in your spirituality, and by helping those who have no help, where God is said to be present, among the poor of the people, the widows, the orphans, the travelers, the strangers, the sick, the desperate, the depressed, the distressed. These are the people that need God the most. Atheists who engage in intellectual discussions are at an arrogant stage of their lives, who desire no help from anyone, but just a good coffee conversation. There's nothing wrong with that, but there's everything wrong with concentrating on that at the expense of serving your spiritual needs and the needs of others around you. Indeed, it could be even worse. Atheists achieve great joy seeing the arrogance present in them be magnified in you, and seeing that you preach what you don't even practice in the manner to which you debate them. Your arguments become a victory to them, and a victory for the demons. At this stage, just concentrate on your own personal spiritual life and almsgiving. Only then do you know the real value of truly proving God's existence and presence to others, not by your arguments, your prophecies, your miracles, or your exorcisms, but by your love to God with all your heart, soul, mind, and spirit, and loving your neighbor as yourself. And sacrifice the feeling that you need to defend God or the faith. God and the Church needs no defense from us worthless people. We do our defense better by doing the will of God as defined above, not by arguing about God. Achieve these first, and when the opportunity comes, when someone wishes to know and question the faith and hope that is in you, then you should be ready to defend it, but do not be the one who initiates the discussion. It must come from others after they see the beauty and change that is in your heart and in the way you deal with others. And that is when you are ready to also learn about Orthodoxy. So because you did that means I did it? when did I say that I do? How do you know my Spiritual life, this guy spiked up my OCD with his slander. Matthew 25:34 Come, you who are blessed by my Father; take your inheritance, the kingdom prepared for you since the creation of the world. 35 For I was hungry and you gave me something to eat, I was thirsty and you gave me something to drink, I was a stranger and you invited me in, 36 I needed clothes and you clothed me, I was sick and you looked after me, I was in prison and you came to visit me. I don't get this, how do you know I don't love Jesus Christ? because someone defends Him intellectually that means they don't love Him? True, but that doesn't apply to me as I try my best to do The Will of The Father in Heaven before my Christian Defending. Do really seek to be a "theologian" in the strictest sense, to seek to "know God" as theology really is? Again how do you know me Spiritually? and by helping those who have no help, where God is said to be present, among the poor of the people, the widows, the orphans, the travelers, the strangers, the sick, the desperate, the depressed, the distressed. These are the people that need God the most. How am I arrogant? because I said an "atheist" cannot refute something like The Resurrection or Jesus Christ(God's) existence? and seeing that you preach what you don't even practice in the manner to which you debate them. Your arguments become a victory to them, and a victory for the demons. I suggest you practice love, as you offended and made assumptions about me and spiked up my OCD by implying that I am not truly Saved. And sacrifice the feeling that you need to defend God or the faith. God and the Church needs no defense from us worthless people. We do our defense better by doing the will of God as defined above, not by arguing about God. Achieve these first, and when the opportunity comes, when someone wishes to know and question the faith and hope that is in you, then you should be ready to defend it, but do not be the one who initiates the discussion. It must come from others after they see the beauty and change that is in your heart and in the way you deal with others. I have had a beauty and change in my heart, I'm just defending Jesus Christ, there isn't a one or the other, you can do both and do them well. So according to you, when one Preaches, In Order that one could get Baptized by The Holy Spirit, and they get an objection, they shouldn't respond(aka argue), which means people won't be Baptized as they should. Arguing and teaching is apart of Preaching The Kingdom, are you going to let Jesus Christ and The Kingdom get slandered etc? no. You've received some very thoughtful and patient replies. You need to read them and think about them - and stop calling people who disagree with you names like "hypocrite" and "slanderer"! My friend, some young people have matured to an adult level beyond my own. But others, like drunk people, are too hard to convince until they sober up. Time will tell you how of you're not able to see the arrogance in your posts. As for your OCD, please continue to see a health care professional so that it would be avoided to "spike" at another time. As for me, yes, I'm a hypocrite, since I daily fail to fulfill my duties to love God as I should. My friend, it is not so much what you are saying but how you're saying it. "Behold, I stand at the door and use a missile launcher and flame thrower.....so open up or Ill force my way in"
why are my posts arrogant? Saying that you will not refute anything about God(The Father, The Son, and The Holy Spirit) isn't arrogance, it's just a fact, God exists and anything against Him is wrong. 11 Command and teach these things.12 Don’t let anyone look down on you because you are young, but set an example for the believers in speech, in conduct, in love, in faith and in purity. 13 Until I come, devote yourself to the public reading of Scripture, to preaching and to teaching. 14 Do not neglect your gift, which was given you through prophecy when the body of elders laid their hands on you. Are you, like St. Timothy, a called and ordained clergyman? I thought you were an internet apologist. Since you like prooftexts, here is another for you. So flee youthful passions and pursue righteousness, faith, love, and peace, along with those who call on the Lord from a pure heart. 23 Have nothing to do with foolish, ignorant controversies; you know that they breed quarrels. There have been atheists as long as there has been religion. Christianity doesn't have a monopoly on having to deal with them. What Christianity does have is several centuries' worth of people of great learning (the kind that I'm afraid is impossible to get today) making spreading the Truth their life's work. And there are still atheists. You seem to think that with a few ideas born out of OCD spikes and thrown onto an internet page in painfully poor English, you can do better than they did. That is colossal arrogance. Also, you barged into a community without bothering to learn anything about it, without as much as saying hi, and started haranguing people, calling them hypocrites and slanderers if they disagreed with you or attempted to recall you to order. That is rude. This is the internet. Words are all we have, and nuances can be hard to convey. But there are people behind each screen, and one needs to treat them as such. You're 18 and there's no known cure, but there's only so much that can be chalked up to that. There have been atheists as long as there has been religion. *Just kidding, you don't know what you are talking about. Your OCD is your problem. You have to deal with it. No one can spike your OCD unless you allow them to do so. AISI, then, you have two valid options: 1) Seek treatment from a mental health professional for your OCD, and 2) take full responsibility for how you respond to others. Don't blame others for doing to you what you do to yourself. Like a poor man given the biggest mansion, you’d think the poor guy would mess that up and go back to the streets again? No, and now Heaven is inexplicable, so no one will sin. For this reason(4) alone suffering is a necessity. This analogy is so full of fail. How do you explain soldiers who have served multiple tours overseas and volunteer to go back over even after suffering tremendous horrors? What about people who took their last dollar to play the lottery, won millions and ended up even worse than before just a short time later? Please explain to me how it is that suffering is a necessity to end suffering when the world is full of counter examples. They can "refute" it in the same way that you are supposedly "proving" it. By making a flat statement that the Resurrection didn't happen or that Jesus did not exist. You're not giving any kind of proof whatsoever. You are just making a statement of something that you believe. Can you state any of the ideas that real atheists have in the matter of religion? Have you really read any of that particular school of thought? You're not countering any arguments why just saying "X is true. I win." And calling people names will not make them more willing to accept your opinions either. Here is the definition of "Refute" "to prove wrong by argument or evidence : show to be false or erroneous"
You have not provided evidence, but instead made statements without any support or documentation. You have not engaged in argument because you have not addressed other people's ideas. You have not shown that something is false, but just said that it is again without any backup to your own words. What about people who took their last dollar to play the lottery, won millions and ended up even worse than before just a short time later? Perhaps, because of the publicity involved, they were hounded by too many people looking for charity. Heaven, where there will be no more sickness, no more diseases, etc added with the experience of suffering and the world, there is not only no reason to sin, but to not even bring the memory of this world up. The Angels, satan Adam and Eve were born into greatness, they knew no evil or the consequences(well they knew the consequences but didn't understand them), they were given the silver spoon and could mess up, we, we were born into suffering, we all need God(The Father, The Son(Jesus Christ), and The Holy Spirit) in our lives, we all need His Kingdom. you mean to tell me that when you go from garbage to everything being a ok that someone is going to mess it up? Unless they are depressed or hunger for war(like your soldier analogy), but depression will be a mere memory, it'll be nonexistent, bravery not necessary, cowardice nonexistent, only thing in existence would be happiness and memory of suffering, and with that one will not sin again because they know what will happen. So is your analogy, hence the reason it fails. you mean to tell me that when you go from garbage to everything being a ok that someone is going to mess it up? I'm telling you that it is human nature to screw things up, and according to what you have written (or at least the way you have worded it) we would screw up if we were taken out of our suffering and put into paradise. First, no where in my analogy did I even hint that the soldier hungered for war. What I mentioned happens a lot. Soldiers return home from immense suffering and then volunteer to go back over - not because they love war (they hate it), but because it is what is familiar to them and they can't deal with the change (one reason that suicide rates are up). Likewise so homeless people would choose to leave their mansion and go back to living on the streets because it is what they know. Second, we as Christians know that there will be consequences for sinning, yet we still sin. These are how you analogy fails. I'm not saying that once we all get to Heaven that we are going to continually screw things up and try to get back to Earth and sinning, quite the contrary, but I am saying that your analogy fails because it talks about earthly life with no spiritual side to it at all. Now if you want to convince me that the homeless man will stay in the mansion, or that the soldier will stay home you need to throw in some spiritual stuff (which you tried to do) and then explain the how and why the spiritual stuff would work.